The newly ratified Maldivian anti-terror law is designed to systematically derogate and restrict most crucial civil and political rights in a highly repressed country. The Act renders the Maldives’ first democratic Constitution to what it has been deduced to – a fig leaf to historicise continued authoritarianism. Anyone in the country could have his or her enjoyment of human rights set back to dictatorship-era standards, to an extent that will make you question whether Maldives ever transitioned from it. The 1990 anti-terror law, repealed through this Act, was enacted to prosecute Abdullah Luthufi and armed mercenaries from the People’s Liberation Organisation of Tamil Eelam (PLOTE), alleged to have perpetrated a coup d’état against the dictatorship*. The manufactured political drama revolving around the boat blast on 28 September may be shocking, with its plot twists and emotive monologues. But because of dramatic irony, the storyline is very clear to us: this is your average tyrant purging his enemies. The explosive speedboat saga is a page turning ‘story within a story’, however, the ‘play’ has a more universal tone that stems from the human need to be free from unequal and undignified treatment. In that regard, the Maldivian antagonists have changed very little from its feudal, coup-mongering, violent predecessors. The new anti-terror law is anything but that, it is an instrument with which the public could be terrorised. It revives the ability for political actors to legitimise abuse of power, a cause for concern given the frequency of political unrest and repression in Maldives’ past and present. The law contains vague terms, such as “undue influence against the government” and “unlawful promotion of a particular political, religious or other ideology”, unfound in the law’s interpretation provisions, however defined as terrorism, in addition to “creation of fear among the public or within a specific group.” It is no coincidence that the definition of terrorism does not explicitly include violent extremism, or religious extremism – the most prevalent type of terrorism today. It makes it clear that the regime’s efforts to counter violent extremism are insincere. Former Deputy Prosecutor General and UNDP’s expert on the 2014 penal code, Hussein Shameem claimed in his commentary that all the offences mentioned in this Act – some 19 offences – have already been mentioned in the new Penal Code. Shameem pointed out that the Act does not criminalise certain “inchoate offences,” which are addressed under the Penal Code 2014. “As it is written in this Act, attempting or planning to initiate training to commit an act of terrorism, or planning to leave to fight in a foreign war are not considered criminal offences,” he said. In order to limit executive influence on how terrorist groups are defined, modern anti-terrorism laws contain a parliamentary approved list of proscribed organisations. While the Act heavily mentions “terrorist groups”, it does not include an annex of groups that the government considers to be tied to terrorism. Instead the president has the power to proscribe organisations. Apart from the president, the judiciary – an institution in which 51% of the public does not have confidence – is given discretionary powers to decide whether literature promotes terrorism. For instance, a statement given during investigation could be used as documentary evidence in court. It is a practice thought to have ended with the new Constitution, which requires judges to rule based on witness testimonies rather than investigative statements. The Act inscribes anti-democratic actions that have been taking place in spite of democratisation efforts. In violation of international human rights law and constitutional protections against pre-trial detention, the Act enables offenders to be held in remand until completion of the trial. The presumption of innocence before proven guilty is watered-down to the regime’s official line – guilty as charged, even prior to prosecution. A person who was acquitted could be discriminated against, simply for being previously accused of any crime. The concern here is not absconding trial, but the existence of unproven guilt, which should not be up for consideration at a forum that claims to administer justice. Constitutional protections such as the right to remain silent, the entitlement to be released from pre-trial detention and the right to legal assistance of one’s own choosing are derogated. The use of these narrowed down rights can be used against the accused, but its probative value during trial is unstipulated. The evidentiary standards are lowered for the purposes of this law in the following manner. A confession made during investigation can be considered as evidence in a court of law. The right to a lawyer can be withheld if one is not appointed within six hours of detention, and client-attorney privileged correspondence can also be adduced to prove guilt of terrorism offences. In most circumstances, dying declarations would be considered hearsay, however this law considers it as evidence if such a declaration indicates guilt of an individual. The Maldivian judiciary, known to suspend lawyers and sentence people in absentia can now issue monitoring and controlling orders in the same manner if the Home Minister requests. 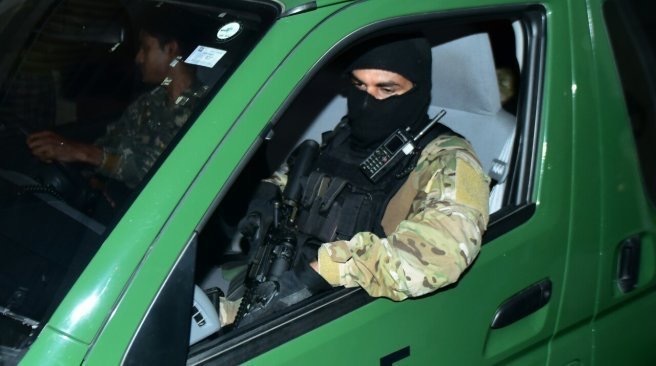 The procedure known as “monicon,” found in Chapter Four of the Act can be initiated pursuant to a High Court order authorising monitoring of terror suspects. Electronic devices such as mobile phones and laptops can be monitored, intercepted and recorded using the monicon order. Additionally, police can enter an address unspecified in a court order if a suspect is known to be in it, they can take photos inside private property, restrict movement, and acquire information about your home and who you share it with. All of this might not be alarming to many Maldivians because these opaque actions are realities that wax and wane depending on the regime’s whims. But now, if you are a suspect – using the controversial order – the Home Minister can electronically tag and “rehabilitate” you, even if you are below 18 years of age. The assumption of powers by the executive is inconsistent with terrorism-related concerns of the country, and the timing of the enactment is ominous. In March this year, the regime imprisoned former President Mohamed Nasheed and former Defence Ministers Tholhath Ibrahim Kaleyfaanu and Mohamed Nazim using the anti-terror law enacted during the 30-year dictatorship. Although this anti-terror has new legal language and powers, it is resonant of a newer version of the old anti-terrorism law. Similar to the old law, little importance is given to the definition of violent extremism, making the Act’s objectives uncertain. The draconian legislation allows executive to usurp the counter-terrorism mandate, introducing reinvented Orwellian methods to strengthen grip on power. If seen through the lens of the 47-year old republic’s history, the anti-terror law is an authoritarian intervention to the rule of law, rather than a genuine effort to counter terrorism. Article 27 of the Act lists types of evidence that can be adduced. *The anti-terror law enacted in December 1990 during the dictatorship of Maumoon Abdul Gayoom – brother of Abdullah Yameen Abdul Gayoom – was drafted in response to Sangu, a newspaper critical of the regime that was banned in June 1990. The regime retrospectively prosecuted Nasheed under the Anti Terrorism Act 1990 for an article he wrote about corruption, published earlier that year, by “Sangu” and “The Island;” a Sri Lankan newspaper. Nasheed was sentenced to three years’ imprisonment on 8 April 1992, but released in June 1993. The alleged coup-makers Abdullah Luthfee and the Tamil mercenaries were prosecuted under the old penal code prior to the 1990 anti-terror law. About the author: Mushfique Mohamed is a practising lawyer at Hisaan, Riffath & Co., and also works as a consultant for Maldivian Democracy Network.